This is one of the many different types of reproduction marks found on fake Roseville Pottery imports. Notice the shape of the "R" in Roseville and the way the letters are straight rather than slanted slightly to the right in comparison to marks on genuine examples. While the absence of U.S.A. is a clue to reproduction marks in some cases, it's not always an indicator. View the next slide to see another fake Roseville mark example. This was mistaken for a genuine mark, but it appears to be a fake mark after further investigation. If this were a genuine older mark, the absence of U.S.A. would not necessarily indicate that it is fake. However, the way the "s" is slanted, according to a collector who studies pottery voraciously, can be an indication that a Roseville mark is not genuine. Most older pieces will have a slanted "s" in Roseville, while almost all newer marks have an "s" that has little or no slant like the one shown here. Remember, however, that determining fakes solely on the mark used can be a bit tricky, especially for the beginner. Many times, you have to look at the color, glaze, and the way the piece is decorated to determine whether or not a piece of Roseville is authentic. You'll see genuine mark in the next slide, with a fake Roseville wall pocket following. This mark example was seen on a piece confirmed as genuine Roseville. Note how the "s" has a definite slant in this mark, unlike the one shown in the previous slide. While the way the "s" takes shape is not always an indicator of a mark being authentic, it is one important clue. Note: There are also genuine Roseville pieces that are not marked. The overall quality of the mold, decor, and glaze must be examined to determine authenticity in these pieces. You'll see a fake Roseville wall pocket in the next slide. This wall pocket is not a genuine piece, although it was spotted at the big flea market in Warrenton, Texas simply tagged as "Roseville" with a marked price of $75. See the next slide for a closer look at the glaze and the way the piece is decorated, which offer clues to authenticity. This is a detailed view of the reproduction "Roseville" wall pocket shown in the prior slide. Notice the sloppy painting on the red flowers and green accents shown here. A genuine Roseville piece will be more finely decorated. The glaze is also has more of a matte finish, which has a rougher feel in comparison to authentic Roseville pieces. View a genuine Roseville Clematis vase in the next slide. This beautiful Clematis vase by Roseville is the real deal. Notice the rich colors, slight shine to the glaze and the nicely detailed flowers and leaves. Examine the decor more closely in the next slide. Notice how nicely the flowers are painted here in comparison to the flowers on the repro wall pocket shown previously. Since Roseville was hand-decorated, the quality of the painting varies due to the skill of the artist. However, it's safe to say that most all original Roseville pieces will outshine reproductions in terms of quality. View two authentic Roseville Zephyr Lilly vases in the next photo. Notice the rich coloring, beautiful shading, and nicely detailed lilies on these genuine Roseville pieces. Continue to the next slide to see another Roseville reproduction with less than lovely flowers for comparison. To see more authentic examples, visit the Roseville Pottery Identification and Value Guide. This reproduction does not have the beautiful shading in the colors and fine detail of the authentic Roseville pieces shown in the prior slide. The flowers actually look garish in comparison, and the glaze does not have the soft sheen present when compared to a genuine piece of Roseville. Some Roseville reproductions are not as obviously fake as those shown in this slide show. Handling as much genuine Roseville as possible and doing side by side comparison with pieces you know to be authentic will help you to learn to identify the better fakes out there. 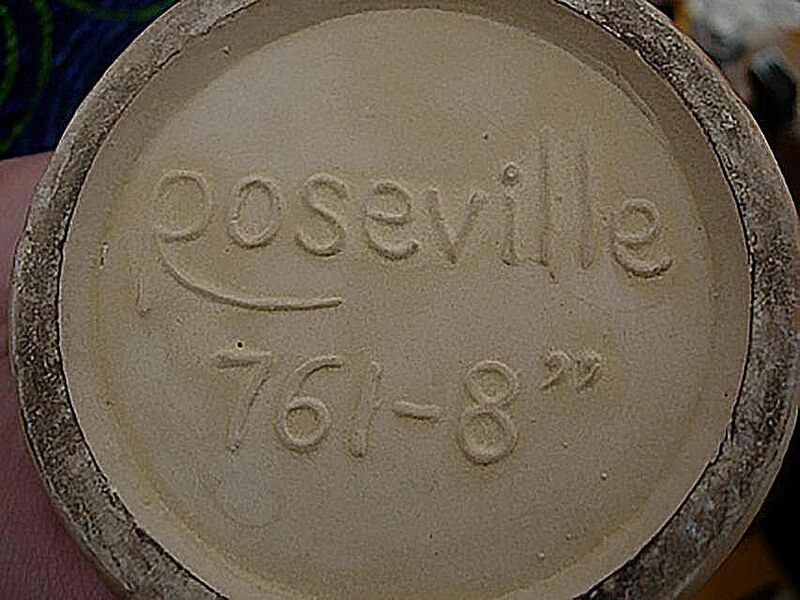 For more on specific types of Roseville, read about Rosevile's Juvenile Line and Roseville Pottery's Desirable Cremo Line.